ic Kathe With an E: Look At That Face! Have you ever seen anything so sweet and innocent in your whole life? Meet Maximus Auerlius, Max for short. grew up with dogs and cats. a pet brings with it. My sons were grown and gone. I agreed but only if it were a small dog. It would be his dog. I could give him this. when he shouted for me to come see. at the dog in the photo. We were there just as the shelter opened. We asked to see "Eli", the name given to him at the shelter. We sat in a little room with a glass door, waiting. Then, this face peeked around the corner. At that point, all was lost. and I knew I was not leaving without him! He fit right in with us. He is our little clown. Oh yes, he became my dog. the blankie from Auntie Ms K.
in the the corner of the dining room. and placed near the kitchen. in front of the front door. There was bed stuffing all over! the same sight would likely greet us again someday. Now, to be clear, I don't sew. I totally missed out on that gene! sweated nervously the whole time. and gave it the old college try. use it to recover a chair. to withstand the great squirrel hunter. was left of Max's bed. just in case it didn't last. I only needed to sew the two sides. I was so upset I didn't take pictures of my "work"
into the cover, loose stuffing and all. but, he has not even attempted to tear it up! Bonus, I can take the cover off and wash it! to rest his head and feel safe. He is and always will be my sweet little puppeh! I mean c'mon, just look at that face! Thanks for sharing Max with us. Lucky Max to have a loving home with you. too cute, good job on doggie bed cover. He's a sweetie. Thanks for the cute story! 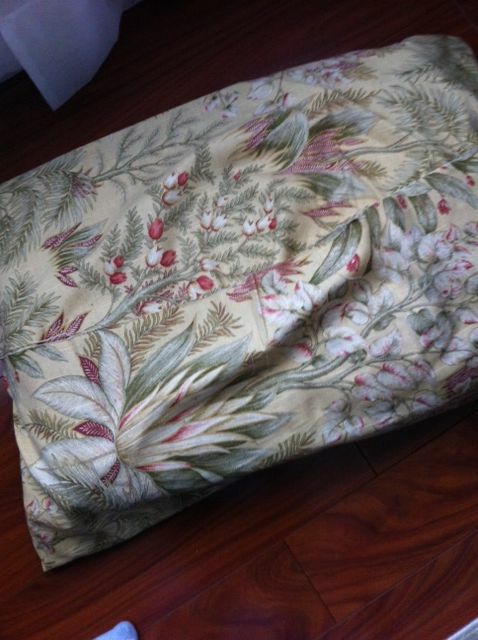 And loved the dog bed cover! Great story, and love the sham idea for the pet bed! I may have to make a few for our little beasty's bed - one can be on her highness' cushion, one can be in the wash, and the other could be a standby. Thanks so much for sharing! Oh, he is so sweet. Wilma says he's a cutie!! Lovely details of this story, I love dogs as well, and Max is wonderful, just feel like hugging him and playing around all day with him. Thanks for this story. How precious is he! Dogs are wonderful, ours has our heart too. He destroyed 4 beds the same way, then I gave up! He sleeps on a blanket and seems quite happy about it. Thanks for sharing this post! As my husband puts it: dogs know how to make us love them and making a face is included :) Max is a charm! Awe Max is great!! A true treasure! We have a Max too but he is of the feline persuasion. Thanx for coming to the party! 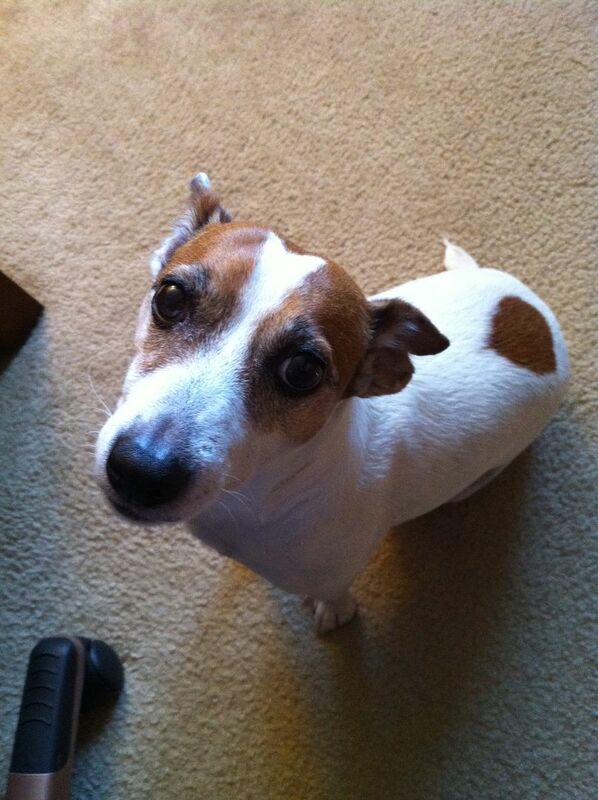 We have had 3 Jack Russell Terriers, currently just have 1, but they sure are sweeties! Your Max is adorable! He's so cute! 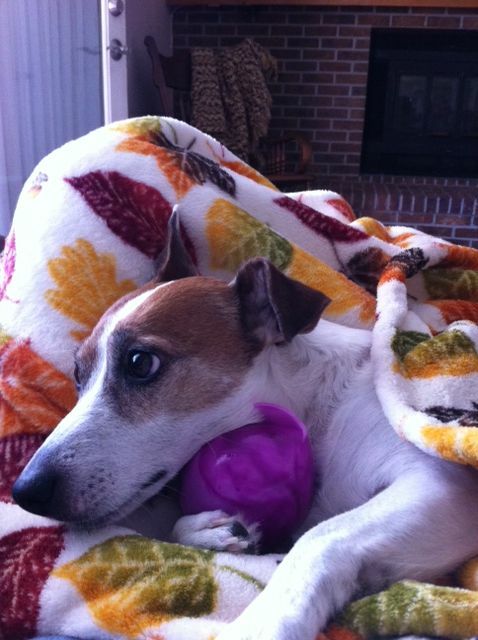 I love the pictures of him snuggling with his blanket and ball. My (60 lb) puppy has a stuffed dog he likes to cuddle with. Thanks for sharing at What's Cluckin! Thanks so much for sharing the history of Max! No, I could not resist that face either. I guess it's true--we don't choose our pets, they choose us. My Bear totally destroyed his first bed, and maybe his second, but thankfully those urges went away. You did a wonderful job creating a custom bed for Max. Maybe he just sensed that it was special. They are smart like that. Max is adorable! We used to have a dog named Max after Gladiator too! Who wouldn't love Max with a face like that. Never mind the mischief. Who cares? And your wonderful story is the reason why I won't even visit the animal shelter anymore. LOL They tug at my heart and I want to take every one of those dogs and cats home with me! (We already have Bridger, Misty, Lionel, and Tuppence - you can see on my blog sidebar) whom we adore and who make life way more wonderful - just like your Max does. Love your story. I was so afraid that you were going to say you had fallen in love with a picture and things did not have the happy ending we all hope for. Your story did turn out to be a good one. 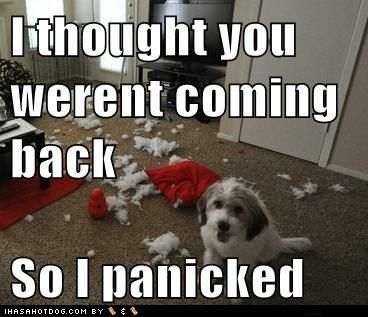 I know the chewed up bed well. How happy I am for you that this turned out well. You can be very proud of yourself and I think Max also appreciates your hard work just for him. My "thrifty" find this month is a new gentleman in the household. I will have to write the story. What a sweetie! I know he brings you much love and joy! best blog post ever!!! i happen to share my life with a mrB too and we have two lovely doggies! (i consider all dog lovers one big family). 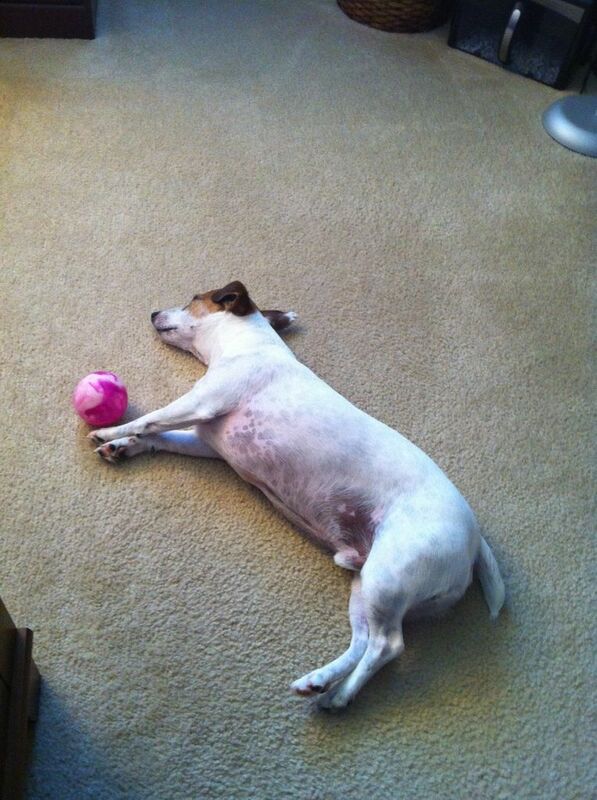 you really made me laugh when "getting a small dog" meant actually "getting a jack russel" (am i right?) they are so full of life and destroy everything... but then again who can resist that "innocent" face? he's adorable! Ha ha ha,....what a serious little cutie. I'm so glad he likes his new bed - way to go puppy mom. :) Thanks for sharing Max at our party this week. That's a face you just couldn't stay mad at. He's adorable! OH how could we ever stay mad at a face like that!!?? Too funny -- we got our puppy after all of our kids left the nest for college. What WERE we thinking?? But we adore our little Ava -- they give us so much pleasure! I love the pictures. I have 3 dogs so I understand. Thanks for sharing this with us this week at the Sunday Round Up Link Party. we sure do love our babies, don't we? New follower from Sunday Hop! Gotta love dogs and children. Good pics! Stop by and visit me when you get a chance! Love your pictures! Cute dog! I come home to something torn up once a week.... We have two labs. Your Max is adorable, and he does have a face to melt you and so can see how you both were a goner when you seen him. 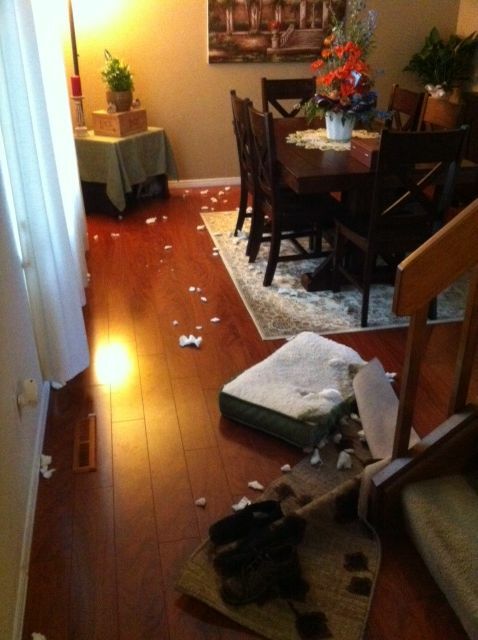 I laughed about the bed tear up because our Bo has done that also. Now he's happy with his bed also, and love being able to wash it. Thanks for sharing your creative inspiration over at Sunday's Best! Cute! We just adopted a Jack Russel/rat terrier mix puppy named Sam. They are so full of energy and personality. Thanks for sharing! I'm visiting from Made by You Monday! What a precious little guy. I love my adopted Pug Terror too. He looks all terrier but cuddles in laps too like yours. Good idea for the bed. What a cutie. He looks like he has tons of personality. I have a Jack Russell named Bella and sadly we have to kennel her when we leave the house because she punishes us otherwise. Our two labs get to be out and about, but she has a lil timeout. Every time I want to trust her she does something naughty :( Your pup is super cute, that's how they make up for the naughties. He's a sweetheart!!! 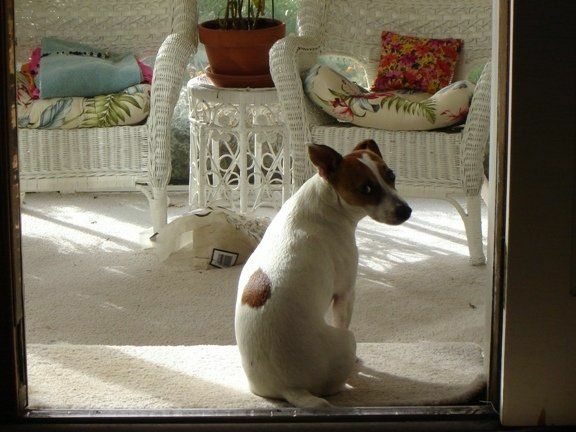 I grew up with a Jack Russell named "RANGER"...He was a real character and lived to be 16... They are an incredible fun breed. Ours was black and tan... Like your guys BED STORY. I have a BEDSPREAD story. My Mom had bought my brother a new CHENILLE BEDSPREAD...It "WAS" a real beauty...One day she came home and couldn't find Ranger. She called and called him and as we looked around for our little lost dog "WE SAW A LUMP" in my brothers bed. Mom called him again AND the lump moved and moved "UNTIL" a HEAD POKED OUT OF A GAPING HOLE in the middle of the bedspread!!! "It was a MAJOR EVENT in our household", and Ranger was then in the IMAGINATIVE DOGGIE HOUSE! Can your little guy JUMP??? WOW, can they JUMP HIGH! and LOVE LOVE LOVE to bounce!!! Tigger would be jealous of a Jack Russell BOUNCE! Love,Love,Love your little guy! Your bed for him is perfect and your story was SOOOOO CUTE!!! Thank you for such wonderful memories!!! Max is awesome. They do wriggle their way into our hearts. Enjoyed meeting him and visiting your blog today. Such a cutie! Great story - and fabulous work on the bed cover too! Thanks for introducing us to Max and the cute story! I'm glad you were able to save the bed, and I love the dog bed cover ;o) Our sweet boxer Kiki is the beat of our heart. Visiting from the Cozy Home Party. That is too funny. Thanks for sharing it at Cowgirl Up. I featured it on the ranch's FB page, so grab a featured button if you like. Loved your story and glad to meet Max. 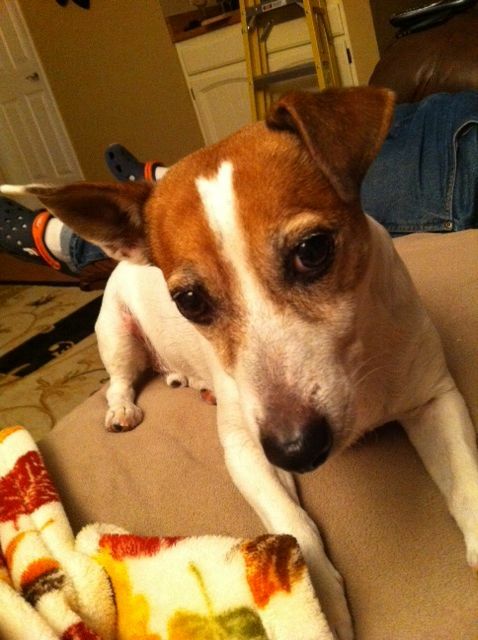 We have two Rat Terriers, Rascel and Maisey. Age 14 and 11. We love them dearly, as you do Max. They are so much fun to watch. I can tell we would be good friends in person, Kathe. I have four silly dogs that are spoiled rotten. Max is a handsome little guy that maybe has a little anxiety about being left alone. I had a poodle like that years ago. I'm glad he likes his new bed. Maybe he won't get into anymore trouble now. Thanks for telling us about Max at Your Cozy Home Party. This was so much fun to read! I like your blog! 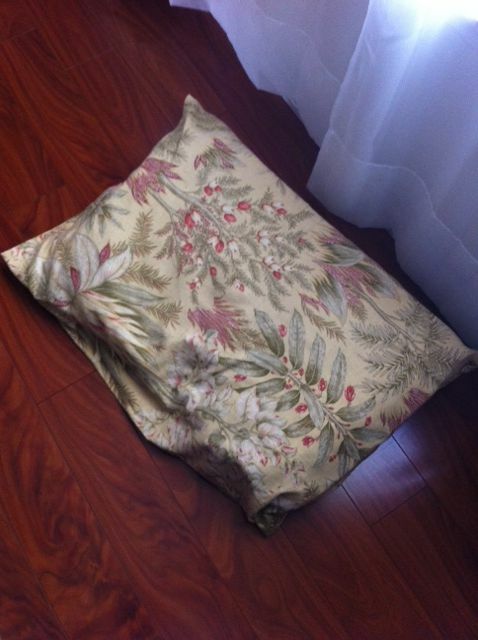 Your dog is so cute and so is your pillow! Nice job on all 3! I'm following you via linky to see what's next. We have 2 jack russells Love them !Max is adorable ! Dogs really are like people only with 4 legs. Great job with the new bed! Stopping over from Show Us Your Find! What an adorable face! Max is such a cutie pie! I would love for you and Max to share this at our Rockin' Pet Linky Party next week! He is so sweet. Rileynwants a dog so badly but our house and my patience is not big enough. Thanks so much for sharing at Whimsy Wednesdays. 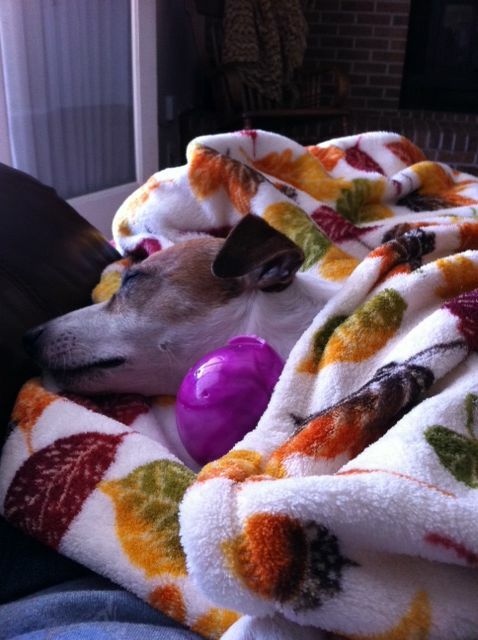 Thanks for sharing your precious pup at our Rockin' Pet Linky Party! Thank you so much for sharing at our Rockin' Pet Linky Party! 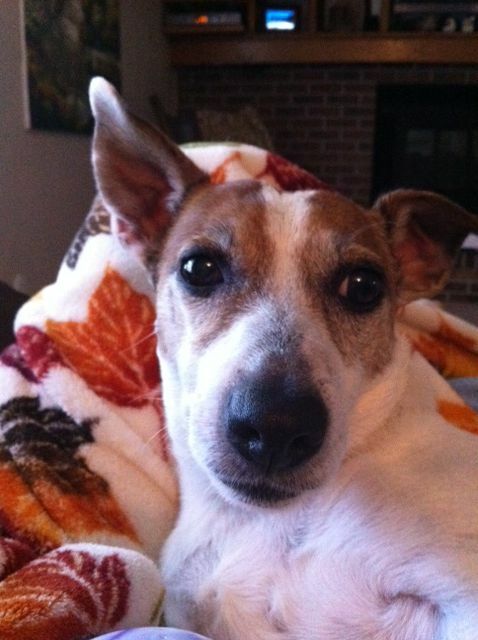 Max, you are such a handsome little dog and we just love all your pictures. Especially the one of you snuggled up with your blanket and ball. Your family is very lucky to have such a nice little dog boy as you. :-) Hope you all have a wonderful day! Oh my gosh! So, so cute! How true is the total mess on a random day when you are away? Mr. Max is one lucky little guy to have been adopted by you and your husband. And you both are lucky to have his unconditional love. Nice job on the bed! That's a lucky pup! Max looks like a great companion. Thank you for sharing in concert with my dog post.